When you purchase a Euro Fireplace from our range, you are buying a stunning, quality product that is not only designed to last; it is crafted to look and be perfect from the inside out. Using the very latest in European technology and combining natural convection with radiant heat and advanced technology to bring to your home environmentally friendly heating. Our heaters give a more complete burn than fan forced heaters to provide, which means a wood fuel saving of up to 60%. European wood-fired heaters don’t use fans to help distribute the heat through your house, by using natural convection our heaters move hot air more efficiently through a home, without the need for an electric fan. Even our insert and inbuilt wood-fired heaters can be installed to move air without the aid of a fan! These fireplaces are great for the environment as they are one of the cleanest burning fireplaces available. With minimal wood consumption and a low carbon footprint, you are assured of perfectly clean and environmentally friendly heating. Vermiculite is used in the interior of your firebox which works to help increase the burning temperature of wood to allow more of the wood to actually burn instead of allowing it to be partially wasted and lost as carbon emissions. Thanks to the use of heavy materials such as natural stone, refractory concrete or ceramic tiles our fireplaces can capture large amounts of the excess heat that is generated by the fireplace. This method allows for the continual even distribution of heat even after the fire has gone out. Fireplace surrounds around wood fireplaces can be the focus of your interior decoration, which offers you the chance to create a statement that suits your whole room. If you are looking for a wood fireplace that offers you both functionality and style you should consider a European fireplace. When it comes to style you can opt for a freestanding fireplace with a classic finish such as the Buller, or, you can opt for a more modern looking Inbuilt. 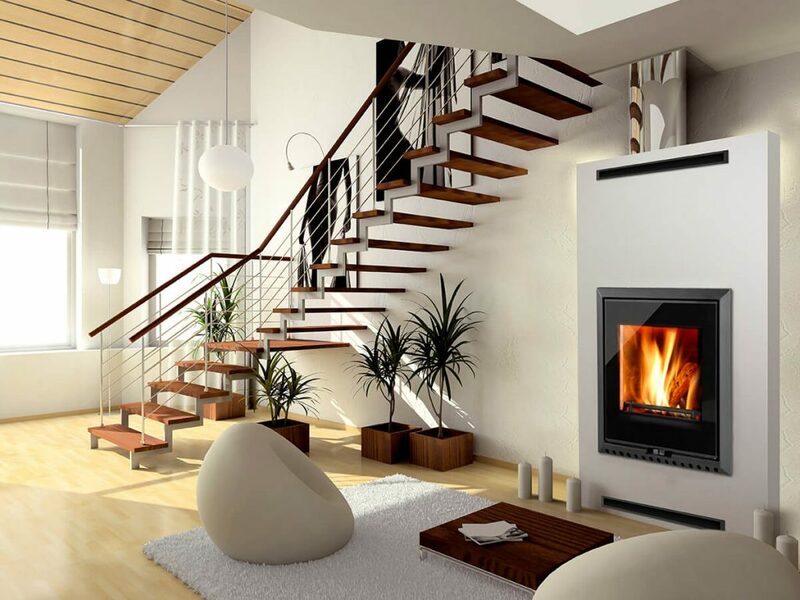 Fireplaces can be compact or quite large and take up half, or even a whole wall. Unlike the traditional fireplaces of the past that were made of stone or brick, modern European fireplaces bring a more streamlined look to your home using steel. Thankfully steel provides not only strength but in combination with vermiculite also is a long-lasting material, European fireplaces can be installed at any height on the wall. Size does matter – always keep in mind the size of the room and the area where the fireplace is to be installed. Have a budget and try and stick to it. Make sure you know what you can comfortably afford before you start shopping.